The 1913 Silk Strike was a watershed moment in the history of Paterson, N.J. On a micro level it was about the workers trying to stop the implementation of a four-loom system, a system that meant more productivity to the mill owners, but harder work and loss of jobs to the laborers. But from a broader perspective it was about immigration and industrialization, unionization and income inequality. In other words it was a product of the social and economic movements of the times. These two books are written by authors whose grandparents lived through the strike. Leslie Rupley’s work, Beyond the Silk Mills, is historical fiction. 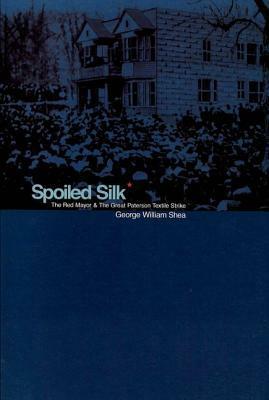 George William Shea was written a history that is also a family memoir, Spoiled Silk. For late 19th and early 20th century immigrants who came to the Paterson area and worked in the mills, there were two different paths they often took to assimilate into their environment. One was to focus on the organization of the workers, some doing so along socialist ideals, while others clamored for more practical gains, like an 8-hour day. The other was to participate in the expanding economic environment and growing consumer culture by focusing on accumulating personal wealth. Those themes run through both of these stories. Too often American history is about presidents and politicians, wars and legislation. Rupley and Shea have instead written their histories about people, about what it was like to live in the Paterson area, or in other industrializing areas in the Northeast, in the early years of the 20th century. A history of people not presidents. That’s a lot more interesting. The story of a family of Jewish immigrants from Poland in the early 20th century. Meyer is focused on organizing the workers in the silk mill. Emma is thinking about making money. He dreams of a socialist society, she of a big house on the east side. Rupley’s story follows this couple and their two children through the Paterson Silk Strike, World War I, a devastating flu epidemic, the suffragette movement and the meteoric rise and fall of the stock market in the 20’s. One of the things I found most interesting about the book is the detail of the lives of immigrants in Paterson. For example her description of the Workmen’s Circle that Meyer retires to at the end of the workday seems to realistically capture the social environment for male immigrant workers. Having been born in Paterson and raised nearby I also appreciated the local color. The book is mostly historical fiction and small touch of romantic novel. Personally I preferred the history. Rupley is a really good storyteller and I enjoyed reading it. Spoiled Silk is the story of two German immigrants, William Brueckmann and Katherine Ruhren, and the family they raised after immigrating to the Paterson, N.J., area in the 1890’s. Brueckmann was to become a prominent figure in the 1913 Silk Strike. Having settled in the nearly town of Haledon, he was elected mayor, running on the Socialist Party line. 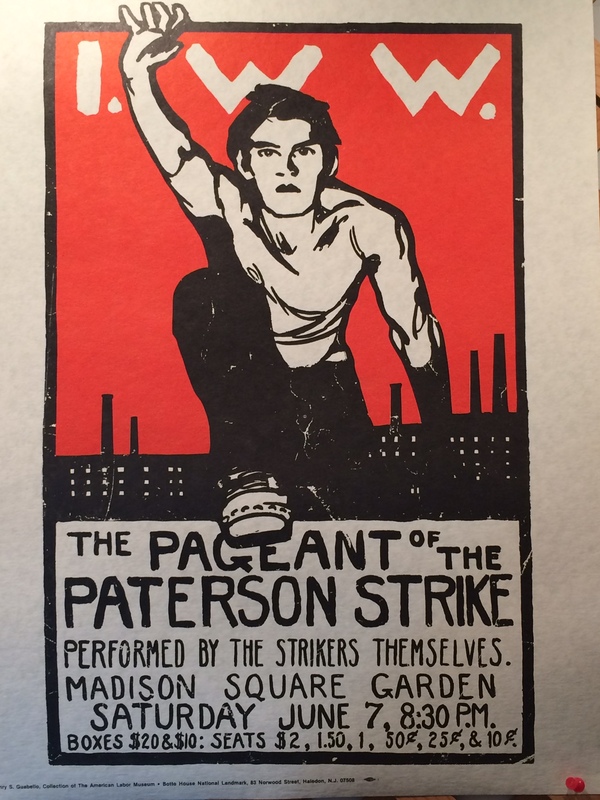 During the 1913 strike the authorities in Paterson prohibited the workers and their union organizers from meeting in the city, so they appealed to Haledon’s “Red Mayor” and he welcomed them to town. There they held regular meetings at the Botto House, home of an Italian immigrant who also worked in the mills and sympathized with the strikers. 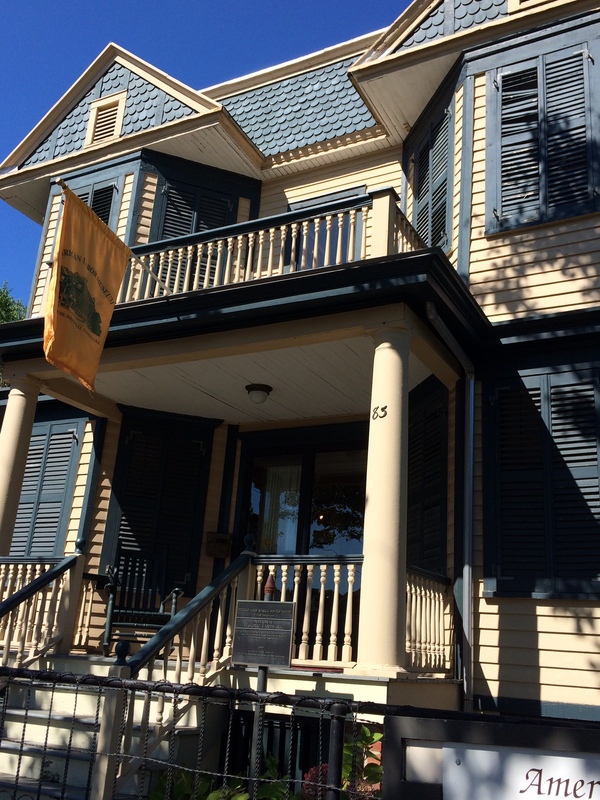 That house is today a national landmark and home to the American Labor Museum. The Brueckmann’s story takes us through the times of the strike and the influence of the “Wobblies,” the radical left International Workers of the World. It also covers the anti-German sentiment that was inspired by World War I, the up and down financial times of the decades between the two wars and even captures a glimpse of the impact of the anti-Communist hysteria of the post World War II years on this by then retired couple. Spoiled Silk is a well researched history of the times, but it is also a family memoir as the author is the grandson of the Brueckmann’s. So it is a story that is told to a large extent through the recollections of the participants. It has its lighter moments too, some of which involve the interactions between the author’s mother’s German family and his father’s Irish family. When this book was published in 2001 Shea was a professor of classics at Fordham. Since it was published by the Fordham University Press. I suspect no one was paying for placement on the Barnes & Noble new and notable table, so it probably didn’t circulate that widely. Too bad. Shea is a really good writer and the story couldn’t be more interesting. It is a work that deserves a bigger audience. This entry was posted in Book reviews, History and tagged books, history, immigrants, labor, Paterson, Paterson Silk Strike. Bookmark the permalink. Both books sound worth reading. The history of ordinary people is often more interesting than that of presidents or royals. You get a better sense of the time. The background you provided reminds me a bit of my own city, Winnipeg, Manitoba, although we didn’t have silk mills. Immigrants came in the late 1800s and early 1900s. There were labour movements for better working conditions and pay that led to a general strike in 1919. The books are probably interesting. Have to admit though that I’m a bit tired of reading about immigrants arriving in America. We had to read such books about Swedish migrants already at the age of 10-12 when I was in school. Personally prefer books about recent Muslim immigrants in Europe. Can’t remember the name of the author but he/she writes about Pakistanis in Little Pakistan in the Middlands in the UK and it’s really entertaining to see how different the parents values are from the children. Another Pakistani/UK writer is Hanif Kureishi who wrote a lot of fabulous books such as The Buddha of Suburbia. If you haven’t read Kureishi, I highly recommend his books. I wasn’t familiar with this story in history. Since I’ve lived in Philadelphia, New York City and central Jersey, I am familiar with the town of Paterson. These books both seem like good reads. I found Spoiled Silk on Amazon and you are right that it isn’t being widely circulated. There wasn’t even one review and so many of our choices these days are based on recommendations. Thanks Erica. I think I’ll go to Amazon and post my review. Granted that there was some heightened interest for me because I am from Paterson but I thought Spoiled Silk was an unusually well written and interesting book. Hi Ken, I’m going to see if I can find these books at our Library. I really enjoy historical fiction, especially if it includes a lighter side on occasion. I often think of the hard work and working conditions the early immigrants endured – I wonder if we have the same fortitude in us. These both sound so interesting! And like you, so much of what we think of as history involves politic, presidents, and even inventions. But this is really how america was made..what gives it color and personality are these things that shaped our culture! I’m going to look for these and download them. Thanks Ken! Ken thanks. If you were going to read one, which one would it be? They do both sound interesting. What I like are books, stories, movies about real people; your book reviews sound like these books are. I usually end up watching the History Channel for history. But if things go with Spolied Silk like you say the publication went, then who knows when tv might pick them up if ever. Were I to choose one it would be Spoiled Silk. I love books like this. Novels and memoirs of “great” people always have their place, but it’s the story of ordinary people that we can find the most connection and commonality in. “A history of people not presidents. That’s a lot more interesting.” Yes, the lives of regular people is what I can especially relate with. Their stories make for the real history of a place. They lived it; they didn’t just preside over a part of it. Books and their reviews (such as you have provided) are truly valuable for helping us to understand our past and, by extension, our present. Thanks for sharing. I would never have known about the silk strike, but I do love when I can experience history through the eyes of a person, real or imagined. Thanks for introducing us to these books! 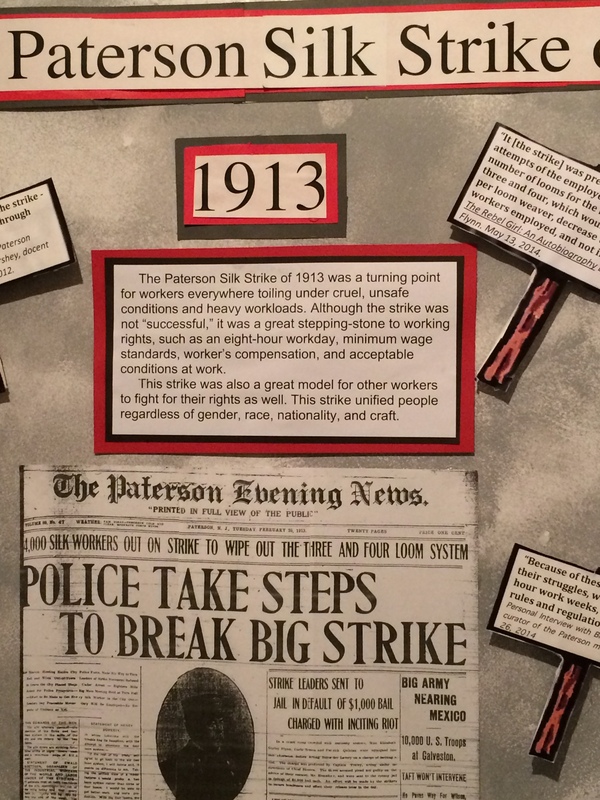 I have to confess that I had never heard of the Paterson Silk Strike of 1913 before. The year 1913 is much more well-known for other things: the ‘institution’ of the federal income tax (per the 16th Amendment to the Constitution), the direct election of U.S. Senators (per the 17th Amendment to the Constitution), and the creation of the Federal Reserve all happened/began in 1913. But as you point out, history is written by and for the ‘haves’ as opposed to the ‘have-nots’. It’s good to know, as noted by the graphic at the top of the post, that the strike played a role in the improvement of workers’ rights. Nowadays all of the ‘sweatshop action’ takes place in countries like Bangladesh and China…or does it? To what extent is American industry still plagued by “cruel, unsafe conditions”? I’m not sure I want to know the answers to these questions. I’ve been looking to add some historical books to my reading list, and both suggestions sound like good contenders! It’s very important to pay tribute to everyday citizens who worked tirelessly during the earlier labor movements to achieve better living conditions. Ken- Thanking you for sharing these books. I live in New Jersey so it does interest me. 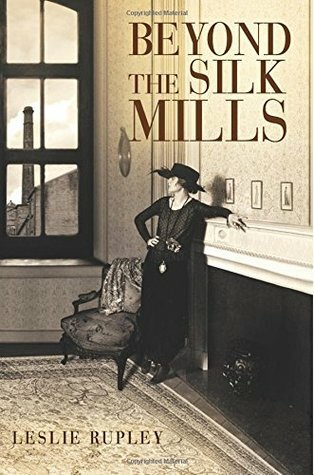 I downloaded the kindle version “Beyond the Silk Mills”, Leslie Rupley. So many stories out there, told or not, that are of incredible interest and shaped the way culture and society operates today; even if the story only played a small part they can often be integral in the big scheme of things. I love these kinds of books and think bringing them to light is important. These both sound worth reading. I am a fan of historical fiction. So many good stories out there just waiting for the right audience. Ken, I didn’t know about any of this in Paterson, so most interesting. Will track them down on Amazon/Goodreads and tag them for a future look. Love the blend of history and fiction in a well-written book. I am not much fond of historical fiction but the books seem interesting and worth reading. There are many immigrants around the world and there are many stories. I am thinking to check Spoiled Silk, I love the review. May be someone also have written about Afghan immigrants in Pakistan. I will try to find this time any related book. Thanks for giving me an idea. Ken, I’m instantly reminded of reading “The Jungle” in high school and what a profound affect it had on me. Growing up in an industrial town (and the birthplace of the American Industrial Revolution) we were raised on the stories of the great inventions, modernization, and corporate successes of our city. What was rarely touched on was the human element that made it all work. Need to get back to my hometown and visit the local Museum of Industry. See if they tell the workers stories with the same alacrity as they tell of the industries successes. I too had not heard of this. I think one of these books would be perfect for my book club. It’s nice to get recommendations from someone familiar with the history. I wonder which would be the better choice. We are all women. Spoiled Silk is the better book.